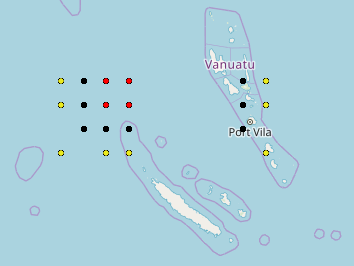 As you can see Vanuatu has on successive days some concentration of stresses.especially on 6th and 7th December. Interestingly near Vanuatu, New Caledonia is even more intense. I do not normally do Caledonia so I gnore it here, even though it is visible where stresses apply. The colour code is Red for 5th Dec., Yellow for 6th December and Black for 7th December. that is why we are the best!